In response to Ex-Cpl Matthew Adabuga, Rawlings resurfaces with chemical interrogation * Blasts Prez Kufuor and security Former President Flt. Lt. Jerry John Rawlings has again unleashed a blistering attack on the ruling New Patriotic Party (NPP) government and the members of the National Reconciliation Commission (NRC), as well as the national security, for what he explained as allowing Chris Asher, ex-Cpl Mathew Adabuga and others to come and malign individuals of the June 4 revolt. Saying the Kufuor administration was spreading lies to deceive the electorate, the ex-President noted that it was a strategy of the government to survive the forthcoming elections. “For the truth to be truly established, there is the need to go beyond both Bible and Koran,” he asserted. According to him, even though the whole truth had already been unearthed by the capos of the June 4 revolution, the government was bent on destroying the defunct PNDC government and its officials. He charged the NPP government with engaging in tribal politics, which he claimed was manifesting at the Afram Plains in the Eastern Region. 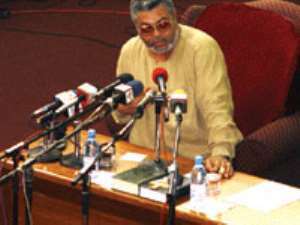 Mr. Rawlings made these assertions in a Radio Gold programme yesterday. Responding to a challenge thrown to him by ex-Cpl Mathew Adabuga to go to the NRC and confess his sins for God to forgive him, Flt. Lt. Rawlings said, “The truth has always been told. But for me to face Adabuga, Kweku Baako, Chris Asher and others, we need to go beyond the Holy Bible and the Koran by subjecting ourselves to the chemical interrogation. “Look, the government has just embarked upon an anti-PNDC campaign to destroy it and its members. The NPP has a problem. They failed to tell the truth because the truth is now prevailing, they are afraid of losing this election and that is why they have brought these people to tell lies. I will take up the challenge to face the people upon the condition that I am subjected. I invite all the advance countries to introduce and subject all of us into chemical interrogation,” he reiterated. The former President, who refused to accept that he was economical with the truth about the June 4 revolt, said it was unfair that spins were put into the revolution to undermine the fabrics of the truth. He pointed out that the abduction and the murder of the three High Courts judges and the retired army officer were given a vicious spin by the NPP government, adding that the cross-examination of Chris Asher by both Dr. Obed Yaw Asamoah and Mr. Tsatsu Tsikata at the sitting of the NRC, had exposed Chris Asher. The truth has already been published and therefore you don't need Rawlings again to know the truth, he said. According to him, the NPP, haunted by its unfulfilled promises, has created confusion in the minds of the people, after committing various crimes, knowing that their crimes will chase them when they leave office. Giving his candid opinion about the ongoing proceedings at the NRC, he said it was unfortunate that cross sections of panel of the commission had lost their credibility while others had improved upon their integrity, adding that the NRC was established to prosecute the (P)NDC government and its members.